It is so buttery that it melts in your mouth the way no other store bought toffee could ever hope too. You can make a double or triple batch without the extra effort it would normally require to make a double or triple batch of individual cookies. It is covered in chocolate….need I say more. It’s easy enough that you could make it today (Christmas Eve), and still have it ready for Christmas. You can cover it in just about anything that you want including crushed peppermints, sea salt, or nuts. I have to mention that after my mom tried the sea salt covered toffee, she exclaimed “This might be the best thing I’ve ever eaten.” No biggie :-). Now if your intimidated by making candy, I completely understand your point of view, but please don’t let that stop you. I would say to just be patient, watch the color of the candy (it starts off yellow, as below, but you want it toffee colored – not brown), and don’t try to rush the cooking process. If you make a big batch, it might take up to 30 minutes to heat this to 298°, but it is well worth the wait. Chopped Topping: finely chopped nuts (1/2 lb), Candy Canes (1/2 lb), Sea Salt (sprinkle), Etc. *If you want the chocolate to look really professional, use good quality, tempered chocolate. If you don’t mind if the chocolate looks a little dull (like mine), chocolate chips will work fine. Combine butter, sugar, water, and salt in a saucepan. Bring to a boil, stirring constantly. It will heat slowly at first, but once all the water has evaporated the temperature increases quickly. 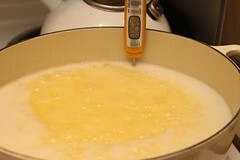 Cook over medium high heat, stirring gently, until candy thermometer registers 298 degrees, but no higher than 310°. 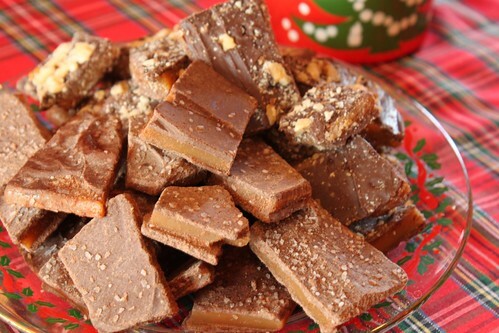 Undercooked toffee is chewy and sticks to your teeth, but on the flip side it can burn if it gets to hot. Once at ~300°, remove from heat and stir in vanilla until well combined. Pour the mixture onto a silicone baking mat or good parchment paper, (last year I used tin foil because it was all I had, and it still worked). 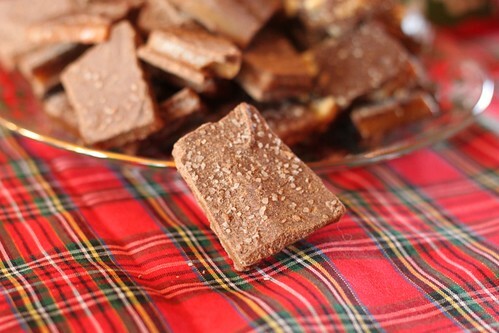 Use a heatproof rubber spatula or offset spatula to spread quickly before the toffee sets. Thinner is generally better. 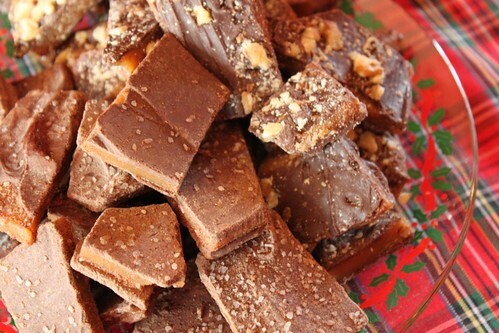 Allow toffee to cool completely, at least 30 minutes (while you go wrap some presents). Blot with paper towel to remove excess oil from the surface. Coat surface with half of the melted chocolate and immediately sprinkle with topping. When chocolate has totally set (you can place it somewhere cold to help the process), carefully flip over (your going to break it apart anyways, so it’s okay if this happens now). Then coat the other side with the rest of the chocolate and sprinkle on topping of your choice. Allow to set, then break into bite-size pieces. This entry was posted on December 24, 2011 by Spice Is Nice. It was filed under Bar Cookies, Candy, Dessert . I’ve not done candy before, but may have to try these, they sound wonderful!